1 Kites come in all shapes and sizes. You are probably most familiar with the diamond shaped kite. Diamond kites can also be called two-stick kites. That is because two sticks are used to build them. This is the shape of kite that Ben Franklin used in his experiments. Two stick kites are easily made using two sticks; paper, cloth, or nylon for the cover; and string. These kites are usually single line kites. That means the kite is controlled using a single line of kite string. 2 Single line kites come in many shapes and sizes, too. A single line kite can measure anywhere from a foot to a hundred feet in length. 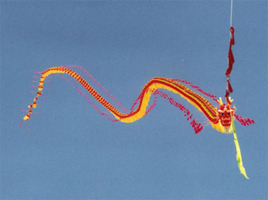 Kites can look like butterflies, caterpillars, airplanes, or even a hundred-foot-long Chinese dragon kite like the one shown in the picture. The diamond, sled, delta, box, and the winged box are all examples of single line kites. 3 Bigger single line kites have a bridle. The strings that tie everything together are called the bridle. The bridle attaches directly to the kite frame. The flying line is attached to the bridle. The bridle can be adjusted according to wind speed. The bridle helps the flyer maneuver his or her kite.